We feel shy to speak to people when we have yellowish or stained teeth? The feeling of getting embarrassed in front of crowd makes us feel depressed. 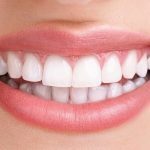 Many say that baking soda is good for whitening teeth in a natural way. But How to use baking soda for teeth whitening is a big question for us. Baking soda is known as one of the most effective natural way for whitening teeth. It’s powerful enough to clean teeth tarter and plaque without being harsh to teeth as it can wear the tooth enamel. Baking Soda can be used alone or even my mixing with other natural ingredients for teeth whitening. We are sharing few methods with you. 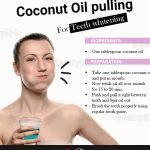 Coconut oil is known for offering benefits like maintaining healthier gums, removes plaque removal and even whitens teeth. It is having lauric acid which helps in getting rid of plaque and bacteria. How it works: The paste acts as a healthy as well as safe teeth-whitening recipe which can take all-required care of the oral health. Repetitions: Repeat the activity 2 or 3 times a week for minimum 1 month. Tips: Sometimes massage your gums and teeth with finger softly as this will help it becoming strong. If you are planning to use lemon juice directly to whiten your teeth then that is a bad idea. This may affect the tooth enamel presently. Lemon juice contains citric acid and you need to dilute it with few drops of water for use. How it work: The paste will of abrasive nature, and will remove built-up plaque of teeth will remove discolorations. Best time to Apply: Always at time of brushing (Day or night). Tips: Stop taking too much acidic food this will protect the teeth from discoloration. 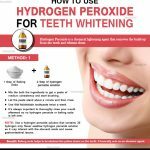 Hydrogen Peroxide is known to be an excellent bleaching agent, and it can truly help in whitening teeth. Rinse with lukewarm water for about a minute. How it works: Mixing hydrogen peroxide with baking soda will give free radicals which will break the stain molecules on teeth. Repetitions: Repeat it twice a week for 2 to 3 months for results. Tips: Dilute hydrogen peroxide with 2 spoon of water before you mix it with baking soda or else it will be harsh for gums. Strawberries contain malic acid. It is a natural enzyme which is considered ideal for maintaining the health and tooth color. How it work: It will help in getting back the lost color of the teeth and will maintain tooth health. Repetitions: Repeat it twice a week for 1 month. Tips: To reduce the acidic content of strawberries you can add 2 to 3 drops of water before mixing it with baking soda. The power of turmeric when gets mixed with lime juice can act as an effective whitener. Turmeric never causes damage to tooth enamel while whitening the teeth. How it work: The mix will work in a natural way to break the stain layers and will give a shining whiteness by at least 2 grades to teeth. Repetitions: More than two or three times a week. Best time to use: At time of brushing. Tips: Do not use too much turmeric as it will stick to your teeth gaps. Floss your teeth if needed. Calcium, magnesium, phosphorus, silicon, sodium, nickel, iron are some of the major elements present in sea salt. It strengthens gums, restricts tarter and bad breath, and also whitens teeth with time. How it works: Salt in the mix will make one salivate, and the saliva will develop an antibacterial barrier for protecting the teeth from discoloration. Repetitions: Two or three times a week. Best time to Apply: At time of brushing. Tips: Be soft while brushing the teeth with the mix to avoid causing damage to your gums. Baking Soda helps in maintaining a healthier oral pH and gently remove the stains from teeth. How it works: Gradually, with time teeth will start getting back its whiter glow and you can again smile back with confidence. Repetitions: Do once or twice a week. Tips: Be soft and gentle while brushing your teeth or it may hurt the gums leading to bleeding. Food habits pay a responsible role towards keeping teeth clean and white. You can speak to your dentist to get the best guidance in this regard. Apart from change in food habits you can use baking soda in any of the above mentioned ways to keep teeth sizzling white. Many say that baking soda is good for whitening teeth in a natural way. But How to use baking soda for teeth whitening is a big question for us.